For me, the floor waterproofness is very important, yet I don't want to be carrying some heavy thing in order to achieve that. In July, I pitched my ultralightweight shelter near Tyndall Creek. The other tent spots were occupied, so I grabbed the one that was left. Unfortunately, that one happened to be in a low spot. The shelter was up and then the rain clouds came in. Soon after the rain started, the trickles of water were flowing underneath the edge of the shelter and into that low spot directly underneath the loose cuben fiber ground sheet that had a sleeping bag and pad on it. To my surprise, the ground sheet floated, so nothing got wet. The ground sheet weighs 2.5 ounces. Did you buy the cuben fiber groundsheet or did you just buy fabric? How much did it cost? The weight is similar to Tyvak, but do you think it is more waterproof or sturdy? If you use a wide 2-3 inch thick sleeping pad, I imagine that too would keep your sleeping bag dry, even if water got inside the tent. But that too adds a lot more weight, but at least you get a cushy night's sleep! My friend who joined me on one of my trips had a wide/long (25-inch) 3-inch thick pad. Unfortunately I have not seen a wide pad in short length. There are different grades of Cuben, aka Dyneema Composite Fabric (DCF), and different types of Tyvek too. But the usual choices for a groundsheet are 1.0 oz/yd2 DCF and 1.5 oz/yd2 Tyvek. The waterproofness of 1.0 oz/yd2 DCF -- when new -- is around 15,000mm head, equivalent to the floor in my older Hilleberg. The differences are not only in the weight and cost but also the durability. DCF is inherently inelastic and this makes it more prone to abrasion and punctures. I'm always amazed at how a sharp object under my Hilleberg tent simply deforms the nylon floor, almost like it's made of rubber. I wouldn't expect my bivy sack that has a DCF floor to hold up to the same abuse. You can easily patch a hole in DCF fabric with repair tape but more general abrasion damage is ultimately terminal with respect to waterproofness. Cuben/DCF is a great material for saving weight although with an arguably shorter lifetime than other fabrics. But if you can afford it then it's one way to save some grams. Interestingly, Six Moon Designs went the other direction witht hte Skyscape Trekker tent a few years ago when they redesigned it; it now weighs 2 oz. more. I will say that the reported weight on their website is accurate, both for my older model and for the newer model that a friend bought, 27 and 29 oz, respectively. As far as the trekking poles, I'm still using a pair of 16 oz (total weight), Cascade, carbon fiber trekking poles bought at Costco in 2015 for $26. Actaully bought in 2014 and replaced for free after I snapped one through my own sheer stupidity. The markings for the adjustable length are wearing off making it difficult for me to know how long I have them set, but still going strong otherwise. More expensive doesn't always mean better. Been wearing La Sportiva Trango GTX for 10 years now. Probably have 5 pairs in mostly worn out condition on the shelf, but they always lasted to the point where the soles were just not giving me the traction I wanted and eventually some of the seams were failing. I had stopped at Grassy Lake for a few photos, put my pack back on and headed into the rain to get up to Lake of the Lone Indian. A few steps and it felt like I was dragging a twig with my boot. A few more steps and I had a look... d'oh! I pulled out some stainless steel braided cable I had in my fix kit and twisted it as tight as possible over the heel to hold the sole in place. It didn't even make it over the pass before it failed and disappeared in the gravel somewhere. The zip tie was next, and I have to say, those things are amazing. It lasted almost all the way to Mammoth where I then headed to replace the now useless footwear. It takes a rather beefy and long zip tie but they don't cost much. Mine are out of a multi-pack from Harbor Freight. nothing fancy. I may try sending this failed pair to Dave Page (https://www.davepagecobbler.com/) to chance a re-soling job. I have heard great things about his work and given these boots are otherwise near new, this looks like the time I should chance hiking in a pair of re-treads. When a heel like that starts to come loose, a few things come to mind as possibilities. One, it might have been cheaply made with substandard adhesive. (unlikely) Two, maybe it has been stored poorly, and the adhesive simply dried out over a long time. Three, it might come loose like that if it was subjected to too much heat. Like, if you left it stored in the desert for a couple of years. That stuff happens a lot with cheaper boots. You just have to cross that brand off your list and move on to something better. Yes, I always carry one or two zip-ties in my pack. it came loose for half the boot all at once. No sign that it let go until the moment it was slapping around. They were stored where I store all my boots, and none of them have ever done that before. I don't walk around in fires (heat) and don't live in the desert. These were near new last summer. With the snow last year they did pretty wet a lot, but that's what they are meant for, plus they were dried out and cleaned for the time they sat on the shelf for the rest of the year. Over the last 10 years I went though at least six pairs of these exact boots. Only once a tiny section of the sole separated on the first trip from new, and Backcountry.com where I bought them exchanged them for a new pair no questions asked. This pair was one of those REI returns with the big X mark on the tongue, so no go on the return or factory warranty here. 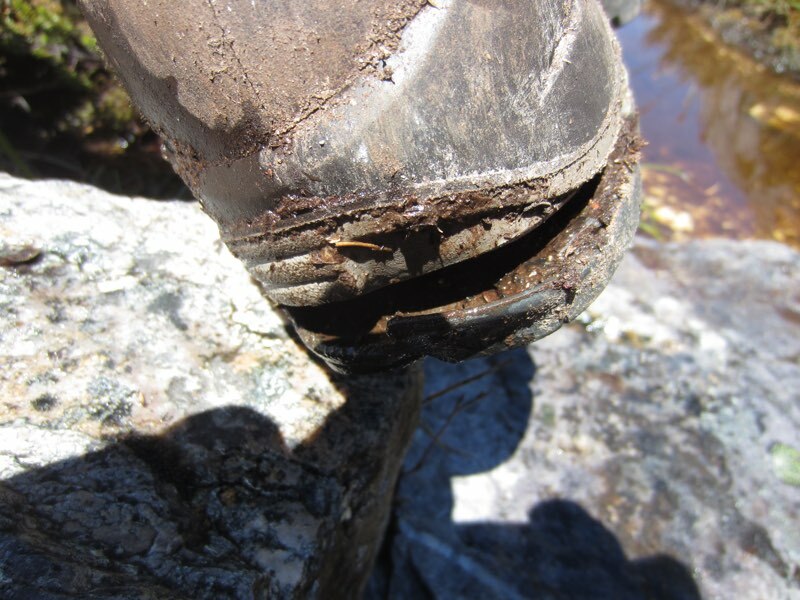 Thing is, I am more disappointed in the Scarpa boots I bought to replace these boots. 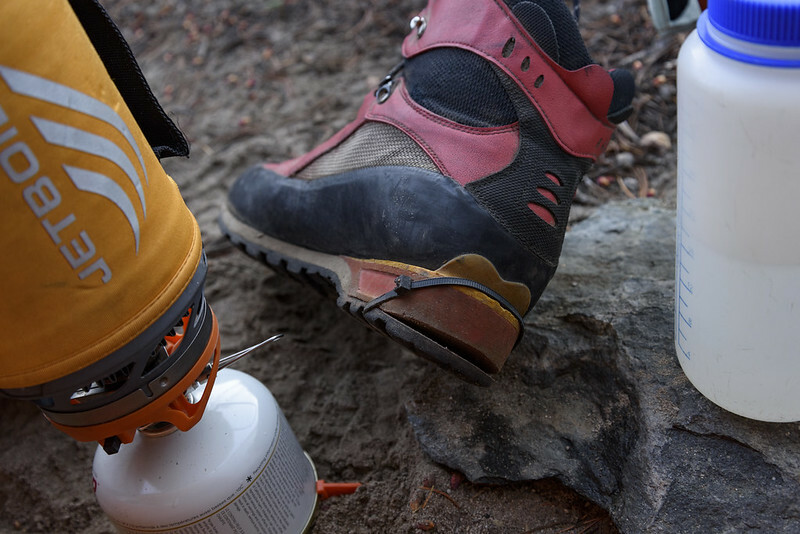 They look like a complete clone of the La Sportiva, but they aren't. Some corners were cut and some design choices were made that may make them look trendy but in the field they underperform. I'll keep them for shorter hikes once of these days, but even though these failed, I spent far too many happy miles in this boot model that I'm not going to chance buying yet another pair of unknown design. At least it wasn't the front of the boot. A flappy heel isn't likely to stop you. Have you tried regluing it? I had the same thing happen to me one time. A nearly brand new pair of boots, the same expensive model I'd been buying for years. With maybe 10 days of use the back end of the sole just came undone in the middle of a trip. Annoying and worrisome. I couldn't think of anyway to strap it in place so I kept an eye on it and tried not to catch it on anything. Had some 4th class and a lot of weird, muddy walking to do with it like that. Tried gluing it when I got out but the adhesive didn't hold for long. Tried another glue but it didn't stick well either. The boot surface was too porous to bond well. So after attempting to fix it I just returned the boots for a full refund. All previous pairs and all subsequent pairs were fine. But this pair -- and a pair of the same model that my wife bought around the same time period -- had this issue of early sole delamination. So I think it was QC issue, a temporary one fortunately as I like these boots. I won't even try to glue it. so much dirt in that foam part of the sole. When the shop in Seattle replaces these soles, they replace the entire sole, not just the Vibram part, likely because it is highly likely to fail again once compromised. I have some boots I wear around the house in the yard and to walk dogs which have failed a few times. Walmart type hiking boot. Some $2.50 Harbor Freight epoxy meant for plastic and rubber has brought them back to usable for a year several times now, but I am sure the glue will eventually fail again. It just doesn't have the flexibility the rest of the shoe has. My friend Paul had a front delam on his boot. I also carry at least 6 heavy duty zip ties and wire. We secured the front of the boot with a zip tie and wrapped it with copious duct tape. Worked fine for the trip out of Tomahawk Lk back to North Lake. He went with Zamberlan boots after that.